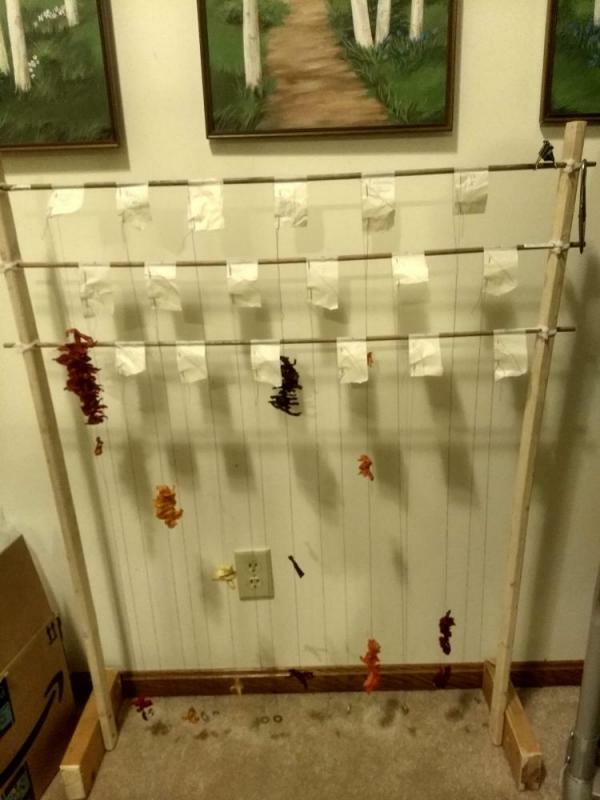 So I was looking at different options for my drying, but I've had great luck threading thais or halved/quartered peppers onto thread for drying purposes. I didn't have a great way to scale that up without filling the mantle at my parents house, so I spent a little bit of time thinking about what I needed out of this thing and then built it. Total cost of materials, we're looking at maybe $12. I used masking tape for the labels, and they double as a place to keep the needle. I used some scrap 2x4 for the feet, bought a 1x2 and cut it in half for the sides, three 3/8" dowels for the cross-ways pieces. 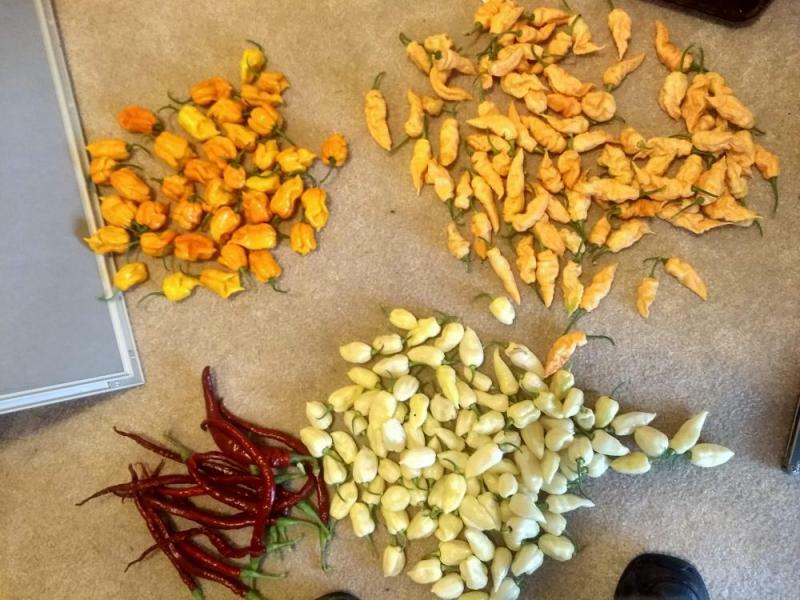 Went to a craft store this afternoon, got two packages of needles, some silk thread (110 yd), and, ended up arranging to sell some peppers to the girl at the checkout there. Brought those to her earlier tonight, made $10 for about 9 ounces of assorted superhots. She said she was going to bring them to her boyfriend's military friend's cookout tomorrow and 'was looking forward to seeing grown men cry'. I've gotten some interesting stories, selling them to individuals. One of the other ones was a girl I met in a chemistry class who wanted a pound to infuse vodka with, which, yeesh, I told her she was basically making mace but she still wanted to do it. I got $10 for a pound there. What I'm realizing, partway into the season here, is that I've got to be flexible with how I'm selling. The guy who does salsa at the farmers market said he was getting everything at $4 a pound now, where I had up to then been selling superhots at 10 a pound, so I'm not going to go down there anymore since the students on the OU campus are willing to pay $10+ a pound, and I've got an amount that makes that more practical than having to try to do large bulk sales. I'm going to end up drying a lot of these peppers that are coming in towards the end of the season, so that's another angle to explore. Anyways - I've got cats and the nuts and washers I'm using as ballast so the thread doesn't tangle are a potential issue - I have a whiteboard that I think is going to serve as a pretty good cat-resistant barrier. Thanks for checking out my little thing, I hope it might help someone trying to solve the same problem. I'll update this thread once I've got a few pounds loaded onto it, I'll be doing a reasonably large harvest this weekend. Thanks again for checking 'er out. Nice job! 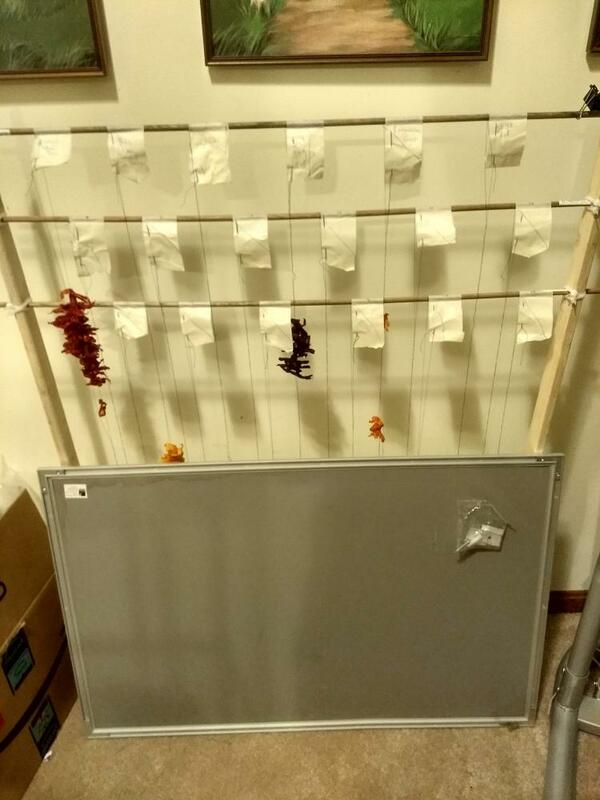 Sort of reminds me of a clothes drying rack my mother hung her hosiery on to dry when I was younger. Yes! Please take care with those kitties! Just a little bit of silk string in their guts will tie up their insides in knots in no time, with nothing but bad happening as a result. I've also read stories of people having their vet remove a needle from the roof of their cat's mouths. Yuk. Curiosity will kill the cat. Maybe use that needle and thread to stitch up a tulle sleeve to hand over the rack and peppers. That's actually a really good idea - I had been thinking, should I put a fan blowing towards them, or would that dry them too fast? A shroud might help there, perhaps. I cut up 4 pounds and strung those and put a low speed fan going towards it but idk, I'll have to see. The lowest speed on that fan is still kind of too high I think, maybe a dehumidifier nearby would be a good option. I have one that might or might not work, haven't tried it, I picked it up by the side of the road. Anyways, here's what four pounds looks like on there. 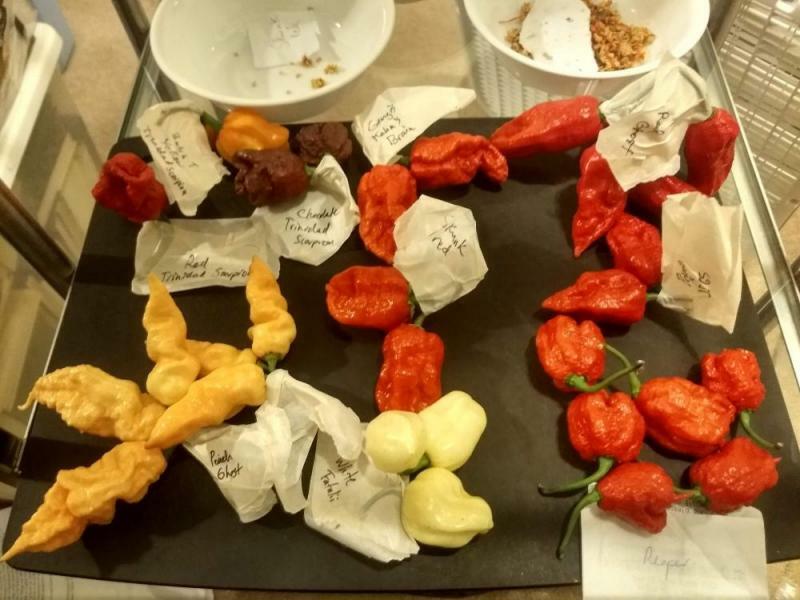 from left to right we're looking at gengis kahn's brain, butch t yellow trinidad scorpions, then two strands of white fatalii, then cayenne, bahamian goat then two strands of what's so far the hottest one I've dealt with on any scale (there will be hotter, trust me) but they are peach ghosts and they are truly f**king insane little fruits.the shapes on some of them, I swear to god, they just look evil. 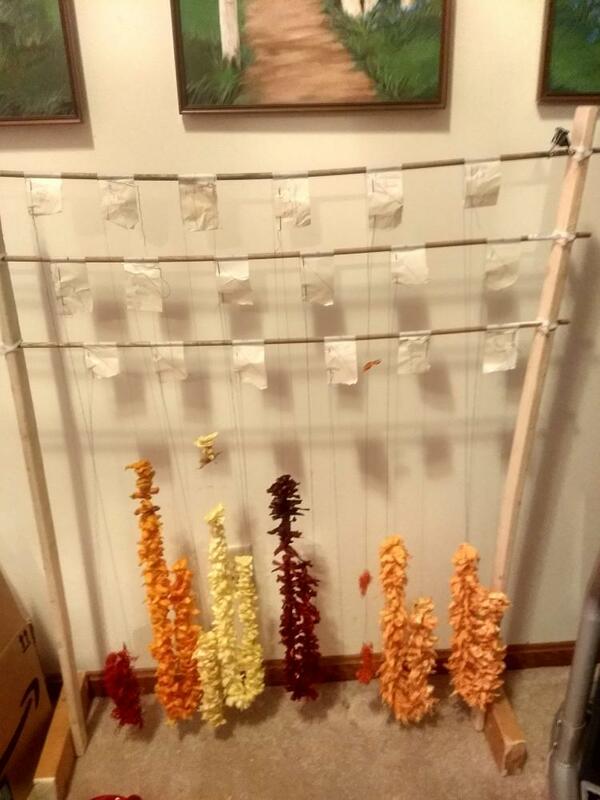 Here's some photos of the pods taken prior to processing. Edited by -brokkr-, 09 September 2018 - 09:55 AM.